After more than a month of concentrating exclusively on white-ball action, the County Championship is back. Amidst plenty of exciting and potentially crucial fixtures, Somerset’s top-of-the-table clash with Nottinghamshire at Taunton could yet turn out to be the most important. 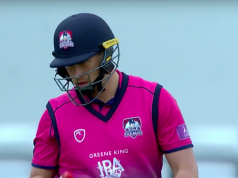 Their last few matches in the Royal London One Day Cup, and limited-overs cricket in general, must now be put to the back of minds as both sides look again to their four-day campaigns. The sides occupy places one and two in the Division One table, with Notts seven points ahead of their West Country opposition, albeit having played a game more than the two sides immediately below them. The Trent Bridge side’s three wins so far have been built on the back of their consistent, unrelenting and high-class fast bowling. A seam attack of Jake Ball, Luke Fletcher and Harry Gurney has operated at a level above that which most county batsmen can reach, the three bowlers taking an astonishing 66 wickets between them so far. Ball in particular has been inspired, taking 27 wickets in just five matches. While their batsmen have not really managed to operate at the same level (they’ve scored only one century between them so far this season), the bowling has been so lethal that most batting line ups have been simply blown out of the water. Somerset have gone about things differently, with the Taunton pitch as usual excellent for making big scores. 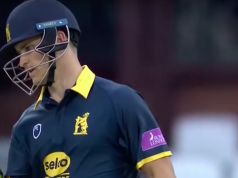 Both James Hildreth, who will surely, surely pique the England selectors’ interest if he keeps on delivering for his county, and Australian Matt Renshaw have already made two hundreds each. Their bowling has not been quite as incisive as Notts’, with Lewis Gregory and the Overton brothers finding it tough going on occasions on that Taunton track. Jack Leach’s return cannot come quickly enough if Somerset are to continue their assault on the title. At the risk of harping on, not many would argue with James Hildreth being described as the best county batsmen to have never gained international honours. His two centuries this season have been dominant, punishing affairs for the bowlers concerned, and it’s not easy to decide what the selectors think he lacks in his game. All Hildreth can do is continue to make scores for his county, and against a bowling line up that will test the Somerset batting to the limit, his experience will be crucial if the home side are to post any kind of competitive score. Now to another cricketer who may consider himself unlucky not to have reached greater heights at international level. Samit Patel is one of the most useful players in the country, being able to hit regular hundreds (at a rapid pace) with his explosive batting, while also take plenty of wickets with his accurate left-arm spin. However, this season he has been somewhat subdued in first-class cricket, with a high score of just 73, and only four wickets so far. As the season progresses and warm weather arrives, on a Taunton track that’s been very responsive to spin in the last few years, Patel’s bowling will need to come into its own here if his team are to take 20 wickets. Experienced opener Marcus Trescothick and premier spinner Jack Leach are both still unavailable (foot and thumb injuries respectively), while Tom Abell, Josh Davey and Tim Groenewald all face late fitness tests but have been named in the squad provisionally. Somerset Squad: Tom Abell (c), George Bartlett, Dom Bess, Eddie Byrom, Josh Davey, Steve Davies (wk), Lewis Gregory, Tim Groenewald, James Hildreth, Craig Overton, Jamie Overton, Matt Renshaw, Roelof van der Merwe and Paul van Meekeren. Stuart Broad and Jake Ball will be unavailable due to international commitments and injuries to Paul Coughlin and Ben Fraine deplete the squad still further. However, Harry Gurney will return to the pace attack in place of Ball after recovering from a calf injury which saw the canny left-armer miss several recent matches. Mick Newell has named a 14-man squad as follows. Nottinghamshire Squad: Steven Mullaney (c), Jake Libby, Chris Nash, Mark Footitt, Riki Wessels, Harry Gurney, Luke Wood, Matt Milnes, Luke Fletcher, Matt Carter, Samit Patel, Tom Moores (wkt), Ross Taylor, Billy Root. The weather is set fair and sunny for most of the four days at Taunton, but scattered showers may creep up on the ground at sporadic intervals, particularly on Saturday and Tuesday. The pitch normally plays true for batting over much of the first three days, but will most definitely take spin over last day or so, as seen over the last few years when Jack Leach et al have run wild in the fourth innings. However, the old cliche about Taunton being a good place to bat still rings true.